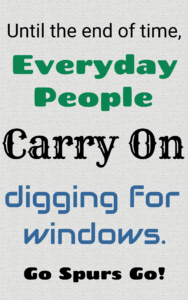 digging for windows – Déjà vu. It seemed eerily similar to the ending of last season. Swallowing the suddenness of the end to a season is hard enough without having to deal with the nervousness that you may also be watching a basketball icon leave the hardwood for the very last time. Having an abundance of basketball icons on one roster is certainly a good problem to have but it doesn’t make it easier that, in San Antonio, the prospect of having to say goodbye to one is now a perennial occurrence. But so it goes, and so it was on a balmy 78 degree evening in the Alamo City late last spring. With his left arm lifted, hand open, fingers separated like a truck driver feeling the breeze whisk through a wave suspended firmly outside an open window, Manu Ginobili scurried sheepishly off the court and towards the tunnel in the last game of his fifteenth season in #BlackAndSilver. It was as if the roaring adulation of the fans, chanting in unison “Manu, Manu, Manu,” was that wind whisking through his wave. As the Paul Bunyan of hoops (a player so magical, I carry his theatrics deep in my soul in a place reserved for sacred memories) disappeared into the tunnel, I won’t lie. I thought that was it. Like Number 21 a year earlier, I thought Number 20 was gone forever. After all, conventional wisdom suggested that at 39 years of age and after 15 consecutive years of squaring off against the likes of the Shaq-Kobe Lakers, Steve Nash and the Seven Seconds or Less Suns, Chauncey Billups and the Bad Boys 2.0 Pistons, LeBron James and the Heatles, the KD-Westbrook Thunder, and most recently the Curry-Thompson-Green-KD (what?) Gluttony of More Warriors in playoff war after playoff war, the greatest player in Argentinian history had nothing left in the tank. After witnessing close to every single minute of his San Antonio Spurs basketball career, shame on me for not recognizing that (when it comes to Manu Ginobili) we can throw conventional wisdom straight out of the metaphorical truck window his hand was waving from as he walked off of the court last May after playing his heart out in Game 4 of the Western Conference Finals against Golden State. Shame on me for not remembering that this all-time great player is an all-time great player because he’s unconventional and full of surprises. On July 19th, Manu Ginobili announced on his Twitter account that, at the age of 40, he would be returning to the San Antonio Spurs for his 16th NBA season. In the end, Manu’s wave was not a wave goodbye (or proof that sending franchise icons to the rafters has become a yearly tradition in San Antonio) but instead it was a wave of invitation for all of us to see what surprises he still has in store for us as he attempts to climb the mountain once again in 2017-18. I can’t wait. Having Manu back in the fold for another title run softens the disappointment over how last season ended but it doesn’t completely take away those pesky What if questions. It’s hard not to wonder how a healthy Spurs squad would have faired against Golden State and Cleveland. While, sure, it would have been extremely difficult to win a title without Tony Parker, given what we know from the small sample we were afforded in the Western Conference Finals with Kawhi Leonard, the Spurs outscored the Warriors by 23 before The Klaw succumbed to his season-ending Zaza Pachulia take down (err… I mean, injury). Taking into consideration the dominating start to the series (and the fact that to a man the Warriors acknowledge that the Spurs would have won Game 1 had Kawhi remained healthy), would we have won that series with Kahwi available? I can’t say for sure but I can say I would have been scared to my very core if I were a Warriors fan. There is one thing that I know for certain. Based on the way we were playing to start Game 1, had we had both Kawhi Leonard and Tony Parker playing at the level they had been playing at prior to their 2017 playoff injuries, the San Antonio Spurs would have won the 2017 NBA Championship. There is no doubt in my mind. But What ifs are What ifs for a reason. The reality is that on May 22nd, the Gluttony of More Golden State Warriors defeated the San Antonio Spurs 129-115 at the AT&T Center to win the 2017 Western Conference Finals in a sweep. And benefiting from former league MVP and current “path of least resistance” emperor Kevin Durant’s inexplicable decision to join the team that had ripped his heart out in the 2016 Western Conference Finals, Dub City went on to capture the 2017 NBA Championship, defeating LeBron James and the Cleveland Cavaliers in five games. Anecdotally, in an all-time example of the unfortunate reality that selling out sometimes pays off, Kevin Durant was named MVP of the 2017 Finals. Manu’s 15 point, seven assists, and three steals not withstanding, in Game 4 the player of this game was Kyle Anderson. In the very last game of his third season in the league, Slow Mo notched his first ever Black & Silver POTG honors with a 20 point, seven rebound, four steal, and two assist performance that show much promise that Kyle can fill an even bigger role on the squad in Year Four. Fast forwarding to the summer, on top of the most heartwarming news (our aforementioned re-signing of Manu Ginobili) there was a great deal of transactional headlines being made on an almost daily basis in the National Basketball Association. Every contender in the league went nuts during this offseason to try to keep pace with the Warriors. The Rockets acquired Chris Paul to pair with James Harden. The Timberwolves acquired Jimmy Butler to lead their young talented combo of Andrew Wiggins and Karl Anthony Towns. The Celtics acquired Kyrie Irving and Gordon Hayward to put alongside Al Horford and a plethora of young talent. (Tough blow, Boston. Speedy recovery, Gordon Hayward.) The Thunder acquired Paul George and Carmelo Anthony to arm reigning league MVP Russell Westbrook with elite weapons. The Cavaliers acquired former MVP Derrick Rose, Isaiah Thomas, Jae Crowder, and (maybe most importantly) former Finals MVP and three-time champion Dwyane Wade (getting the band back together) to bring reinforcements for Kevin Love and basketball’s greatest active player, LeBron James. There was, however, one contender that didn’t join the NBA’s arms race. You guessed it. Our San Antonio Spurs decided to get back to basics and spend the summer building from within. By all accounts, our young talent (Dejounte Murray, Bryn Forbes, and Davis Bertans) worked their tails off in the summer to get better. Tony Parker and Kahwi Leonard (while not available tonight) are expected to make full recoveries from their injuries. Tony played like the champion he is during last season’s playoffs and if he can spend the next six months preparing to replicate that performance again this spring, everything he gives us during this regular season becomes simply icing on the cake. Kawhi has improved astronomically as a basketball player each and every offseason of his career. So much so that by the 2017 playoffs, he was the best basketball player in the world, in my opinion. Regardless of the injury, I expect his game to have taken the same leap this summer that it has every summer past and if it did, look out. If Kawhi made the same year-to-year leap again this offseason, his status as best basketball player in the world won’t merely be my opinion, it will be an objective fact. And the thing that brings to another reason I’m hopeful for our 2017-18 prospects: the remarkable developments in the marriage between LaMarcus Aldridge and the San Antonio Spurs during this preseason. After facing criticism for failing to carry the team to even one win over the Warriors during his first trip to the Western Conference Finals, LaMarcus spent a good part of this summer dealing with constant trade rumors swirling around his head. According to reports, the Spurs pushed hard to move on from LA in order to put more young talent around Kawhi but a trade never materialized. As training camp approached, it became evident that LaMarcus was going to start the season in a San Antonio uniform and I think most of assumed that R.C. Buford would try to trade him again before the midseason deadline. Then something interesting happened. Reports started leaking that prior to training camp, LaMarcus Aldridge approached Gregg Popovich for a heart-to-heart to discuss his unhappiness about his role on the team. Unsurprisingly, connecting with Coach Pop in an intimate way yielded spectacular results with Aldridge coming out the other side of it feeling much better about his place in the Spurs family. He backed it up on the court during the preseason putting up all-star (per 36 minute) numbers. Then yesterday, in a move that seemed to come completely out of the blue, the San Antonio Spurs signed LA to a longterm contract extension through the 2020-21 season. I find this move to be remarkable because it almost certainly guarantees that LaMarcus Aldridge is going to be Kawhi Leonard’s primary sidekick as he moves through the prime of his career. While many Spurs fans might be uneasy about locking ourselves into this pairing, I think it’s fantastic. Keep in mind that with Leonard and Aldridge as our one-two punch the San Antonio Spurs are averaging 64 wins per season. There is nothing broken about that. Also, remember…this is who we are as a team. As stated earlier, we build from within. If LaMarcus Aldridge isn’t fitting perfectly into our system, our solution shouldn’t be to trade him. Our solution should be to rework the system, make him comfortable, and figure out a way to fully utilize a player that is still easily one of the ten best “bigs” in the league. It’s funny to me that because of his struggles in the Warriors series everyone seems to have forgotten that in Game 6 of the Western Conference Semifinals, LA went bananas to the tune of 34 points and 12 rebounds to close out James Harden and the Houston Rockets. If connecting on a human level with Coach Pop has finally allowed LaMarcus to feel comfortable in our system, I expect to see that beast-mode Rocket-dominating Aldridge on a nightly basis this season. And, man, am I excited about it. To summarize, since it’s better to say things late than never… Welcome to the Spurs family, LaMarcus. This man in the Oval Office is a soulless coward who thinks that he can only become large by belittling others. This has of course been a common practice of his, but to do it in this manner—and to lie about how previous presidents responded to the deaths of soldiers—is as low as it gets. We have a pathological liar in the White House, unfit intellectually, emotionally, and psychologically to hold this office, and the whole world knows it, especially those around him every day. The people who work with this president should be ashamed, because they know better than anyone just how unfit he is, and yet they choose to do nothing about it. This is their shame most of all. Man, I love it when Pop goes (off on) the weasel! What brings me the most hope of all that the San Antonio Spurs will capture the 2017-18 NBA Championship? You guessed it. Our coach. I can’t say enough about how proud I am of the moral clarity Gregg Popovich has brought to our national political conversation since the 45th President of the United States of America was sworn in on January 20th. It is truly making a difference. His commentary on Donald J. Trump is resonating with leaders of the resistance movements in a remarkable way. Pop is speaking out and (whether we all want to admit it or not) the entire country is listening. Go Pop Go! While I’m proud of Pop’s patriotism, obviously his political speech is not reason enough to believe, against all of the predictions of the so-called experts, that we will capture our sixth Larry O’Brien trophy next June. Pop’s political convictions, however, are a reflection of a man, a team, an organization that knows who we are and knows what it takes to win. We’ve seen this movie before. You know, the one where the so-called experts overreact when other contenders load up on talent during the offseason to form allegedly unbeatable super teams while down in little ‘ole San Antonio, the Spurs are quietly going about the business of developing players and building a a team who’s sum is greater than its parts. Pop and the Spurs pound the rock day after day, week after week, month after month, until we’ve transformed ourselves into a well-oiled “super team” slaying machine. Pop’s developed a winning formula for building from within that can transform an ordinary roster capable of beating any amount of talent that is put together by our competitors. Had we stayed healthy, he would have proven that his formula works again last year. That’s okay. After staying pat this offseason, tonight he starts working on revising the script. This movie already has four sequels and with any luck in the injury department, we’re about to film the fifth. Now wiser than ever, Gregg Popovich is getting ready to Alfred Hitchcock the NBA once again. Get your popcorn ready because he might not only take down the defending champion Golden State Warriors in 2018 but perhaps a sitting U.S. president, as well. One thing is for sure. 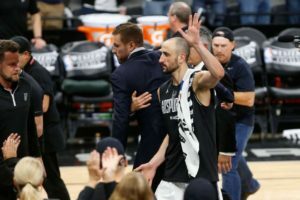 Manu Ginobili is back and will be right there alongside Pop for the former and should the latter happen…Manu will most certainly be waiving goodbye this time, at least as Donald J. Trump is shown the door.